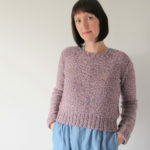 You used The Croft Shetland Tweed for your recent Ravelry project; The Weekender by Andrea Mowry. What made you choose The Croft? 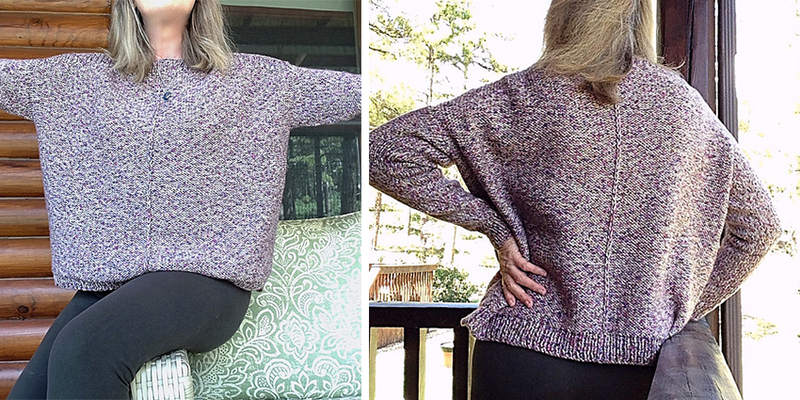 The reason I chose The Croft to make my Weekender sweater was because the sample yarn used was more costly and had 42 less yards than The Croft hanks. I wanted a wool yarn for sure to use as a substitute. I also loved ALL the color choices. I always read a lot of reviews when choosing a yarn I’m not familiar with. The Crofts’ reviews were all stellar and that was the final deciding factor. How did you find it to work with? I found the yarn very easy to work with. 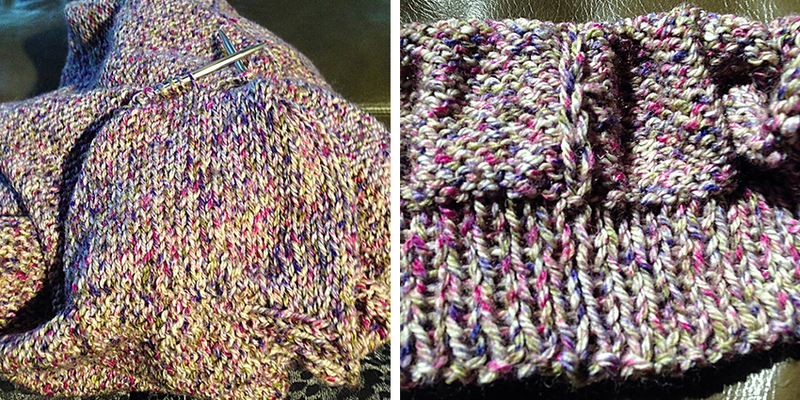 It’s soft, has a nice even twist, ZERO knots and pretty much flew off of my needles effortlessly. The hanks were very well wound and a cinch to wind into cakes. Since it is a superwash wool I couldn’t felt the ends of a new cake together but I got a strong safe join using the Magic Knot. I could neither see nor feel the tiny knot that resulted in the knit fabric. I did wash and block my completed sweater. I’d never worked with superwash wool before so researched the suggested method for it. Also researched other projects on Ravelry made with The Croft. I found from reading that this yarn likes to grow quite a bit after washing. I zipped my sweater in a large lingerie bag to confine it a bit and for ease of lifting it afterwards so as not to stretch it. I machine washed it in cold water on the gentle cycle along with some Wrapture wool soak. It grew from bloom somewhat but not to a ridiculous level. I massaged it with my fingers sort of like shaping dough into the dimensions I wanted. It dried into the most lovely, extremely soft fabric with perfect drape and stitch definition! I haven’t actually worn it long enough to gauge anything like fuzzing or pilling, but while I was wearing it taking project pictures I felt zero itch, just comfortable, warm fabric right next to bare skin. It wasn’t super heavy either. Would you recommend it? Would you use it again? I would recommend this yarn with gusto and no hesitation! I’m pretty much in love with The Croft and would absolutely use it again. It’s fun and rewarding to use! Which other kind of projects do you think it would work well for? This yarn would be a great choice for scarves, hats, gloves, mittens, blankets, capes, shawls and of course sweaters! I have a couple of cakes left over and will make a matching hat for my Weekender. The way I found The Croft was I Googled Aran weight speckled yarn and it was the first one that popped up. I visited the UK in 2009 and LOVED the Yorkshire area so much, with all the herds of sheep grazing in beautiful country pastures. Being a certified Anglophile I was ecstatic when I saw the name of the company, WYS, and where the yarn came from! If you like exceptional wool that is lovingly made, has lovely color ways and gives you a lot of yarn for a great price look no further than The Croft! Thank you so much Pam! We loved hearing your thoughts on The Croft, that you enjoyed working with it so much and we love your finished Weekender! 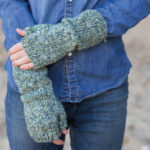 You can find all of Pam’s projects on her Ravelry page and you can also find her beautiful crocheted creations in her Etsy shop Crocheted4Ewe. 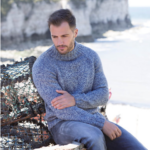 We now have The Croft in all the new Shetland Colours along with Shetland Tweed at YAK! Below are some more Croft project ideas.